Photograph of an elephant with a golden ambari at Baroda in Gujarat, from the Lee-Warner Collection: 'Baroda views and buildings, c.1890' taken by an unknown photographer. The elephant was one of about 55 state elephants owned by the Gaekwar Sayaji Rao III (r.1875-1939), 12th Maharaja of Baroda. They were used in ceremonial processions and were granted to high officials as a mark of royal favour. 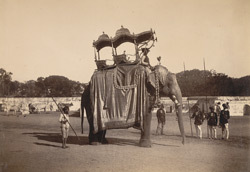 In this side view, the elephant is shown caparisoned in cloth of gold and bears on its back the ambari, a throne or state howdah made of gold which only the largest and strongest elephants could support.